Trust in North American public museums has taken a major knock over the last few years: well over 100 objects have been returned to Italy, and a museum curator is currently standing trial. What has been the issue? Museums have been seeking to develop their classical Greek and Roman collections - but had not been asking too many questions about how the stunning objects had been appearing on the antiquities market. What were the sources for these acquisitions? Italy had not been releasing items found in excavations as these were retained in regional museums. So were they from previously unrecorded private collections? In the mid 1990s a raid in the Geneva Freeport brought to light a major dossier of images and documentation that provided an insight on how objects moved from ancient burials in Italy through Switzerland and onwards to collections in Europe, the Far East and North America. This photographic evidence brought about a major shift: museums were only too keen to negotiate some returns. Now Italy has responded positively to the co-operation. Antiquities are being placed on loan to North American collections: among them the symbolic statue of Eirene (Peace) to Boston's Museum of Fine Arts. These are loans, not purchases. And some North American museum directors still try to address yesterday's debate about ownership - and they miss the point. The shared aim of archaeologists and museum curators is to present and explain the past through finds, many of which are displayed in museums and galleries around the world. And objects excavated by scientific methods can be understood in far greater detail than something ripped from an ancient burial that loses all its associated information. So as the Euphronios krater goes on display at the Villa Giulia in Rome, surrounded by finds made in the great ancient cemeteries of Etruria, the debate can turn to how our shared cosmopolitan heritage can be protected and preserved for future generations. Can we be good stewards of the past? Detail from the Euphronios krater once displayed in the Metropolitan Museum of Art, New York and now in Rome. Sleep and Death lift the body of Sarpedon from the field of battle before Troy. Very interesting that you would characterize the Krater as part of our "shared cosmopolitan heritage". I suspect that the nationalistic Ministry of Culture in Italy would have a different view -- even though the pot is Greek. You ask an intriguing question, "Can we be good stewards of the past?" Was not the Met a good steward of the Krater? I venture to say that if it is preserved in Italy like most of the millions of other antiquities sequestered in Naples and Rome have been, the Met was a far better steward for this object of our shared heritage than the Italians could ever think of being. It really is not about stewardship, is it? It is about ownership and nationalistic interests are parochial to say the least. Thank you for your comments about the Attic red-figured calyx-krater ("the Sarpedon krater"). MiBAC protects (among other things) the archaeological heritage of Italy and that includes ancient Etruria, the likely "find-spot" of the krater. The Villa Giulia provides an excellent "home" to display the krater among finds from Etruria. The Italian authorities are sharing such archaeological finds with North American museums through a programme of loans. The debate has switched from "ownership" to "stewardship". I don't mean to create a debate here, but it seems to me that if the cultural property debate has shifted from ownership to stewardship then use of the National Stolen Property Act in the U.S. to enforce nationalistic laws of other nations (that do not apply in the U.S.), like the Schultz case for example, is not appropriate. Either the property is owned by somebody or it is owned by nobody. Stewardship is merely a PC word for temporary ownership. If Italy someday were to return to a monarchy, or become a conquered nation, the ownership and thereby stewardship of the famous pot could change again. It has happened countless times, in countless places, throughout the ages. Even under the current government, Italy could theoretically decide to sell or give away the krater and issue an export permit. Who would own it then? Whose cultural heritage is it? I disagree with you that the issue of ownership has become subsumed by the issue of stewardship. Ownership is the very basis of nationalistic retentionist laws and is therefore very much at the center of the debate. As I said, no need to debate this point here, it has been debated elsewhere ad nauseam. I am always happy for people to contribute to the debate. We all have responsibilities towards our shared cultural heritage. The issue is how museums (and private collectors) can adopt ethical acquisition policies so that they do not encourage the destruction of our cosmopolitan past. Museums can be temporary stewards through a system of loans. Does it matter if the Attic krater displayed in a gallery is owned by the museum or is part of an archaeological collection preserved in another country? I think we may actually be on the same page in some respects. Cultural Heritage is really NOT a geographic nor ethnic idea. Each person's cultural heritage is different, though commonalities bind us within certain identifiable groups. Collectors have a cultural heritage as much as the aboriginal tribes of isolated regions. We should all share our cultural heritage with pride and preserve it to the best of our ability. We should be equally careful to preserve property that elucidates the past and present cultures of others. The krater is not part of the cultural heritage of Italy, though it may in fact be the cultural property of Italy. It DOES matter who owns the krater, but not from the perspective of its value as a symbol of a past culture. Nobody can own the past, but the artifacts that teach us about the past are a different thing. We all have a right to own tangible objects of any age. If it really didn't matter, why did Italy not simply ask for a loan of the krater instead of fighting for it's return? The cultural property debate does not revolve around heritage, it revolves around "global ownership" of what is generally called cultural property and the resistance to that by nationalistic ideologies. 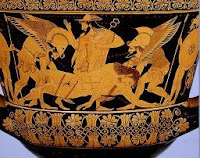 Why do you think that the Sarpedon (Euphronios) krater is not part of Italian culture? The krater appears to have rested in an Etruscan tomb for nearly 2500 years. Yes, it was made in Athens - but it was snatched from an archaeological context within the modern state of Italy. We will never know if New York's Metropolitan Museum of Art would have made a loan of the krater. But we do know that this never came to court: there was an amicable agreement. I do not know if you have ever seen this krater. But when you are next in Rome do go and see it. I plan to do just that ... and then walk round the archaeological galleries in the rest of the Villa Giulia. Yes, I was very fortunate to have seen it at the Met. When I was a grad student in Art History many years ago the Met was just acquiring it and it made quite a stir with numismatists because Thomas Hoving sold the John Ward collection of ancient coins in order to buy the pot. I wish they had kept the coins and forgot the pot. I can't see how any object that was made in Greece and recovered from an Etruscan tomb can be part of Italian culture. No Italian (save one, apparently) ever saw it until it was displayed in the Met. The Etruscans were certainly not Italian. Let us say, for example, that 1000 years ago a native of what is now British Columbia traded an implement to a Native American living in Washington State. The implement was buried with the recipient and is dug up in 2009. How, by any stretch of the imagination could this implement be considered part of modern American culture? The U.S. government might very well, however, assert a claim of ownership if it was found on public land. My point simply is that cultural heritage, cultural patrimony and cultural property are terms loaded with ambiguity and the laws that try to address varying claims always end up dealing with ownership, not ethics. It's a Greek art object, not Italian. We don't know how it got to the Etruscans from Greece. It was then "taken" from the tomb. Who decides how far back it goes. Will Italy be giving back Titus' loot from Jerusalem? Will Italy be giving all those obelisk's back to Egypt? etc. The Met, the Louvre, etc are sort of the world's pubic repository points where more of we who live in the world can get to see them.